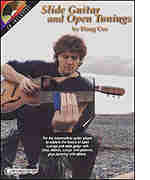 This book/CD pack for the intermediate player explores the basics of open tunings and slide guitar, covering licks, chords, songs and patterns. This is not just a repertoire book, but rather an approach for guitarists to jam with others, invent their own songs and more. The accompanying CD features 37 tracks.